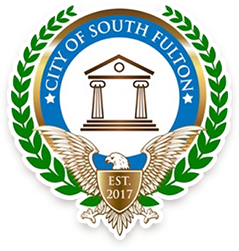 The City of South Fulton is interested in the opinons & advice our residents! Pleae take the following surveys to share your thoughts. Your email is used as a Unique Identifier. Your responses will be submitted without your email address. ​During a year-long process, which began before the City Council was sworn in, officials collected over 250 proposed names from South Fulton Residents. In Winter 2017, In 2017, South Fulton's City Council hired a marketing firms Vevo360 & firstClass Inc. to help select a new city name. The firm narrowed resident submissions to 20 finalists and held town halls to gather citizen feedback. ​At a Special Called meeting on November 13, 2017 South Fulton’s City Council voted on a new city name. During 3 rounds of voting, every member of City Council voted for the name Renaissance (see video). The name was vetoed the following month by the Mayor, and the new city continues to be known as South Fulton. Select one. Unsure of which Council District you live in? Click the link below & input your address. Not sure which Council District you live in? Click HERE and put in your Street Address to find your City Council, School District, State Legislature & US Congressional Districts. Your email is used as a Unique Identifier. Your votes will be tabulated anonymously. If you request a response to your comments, your email may be used to contact you. 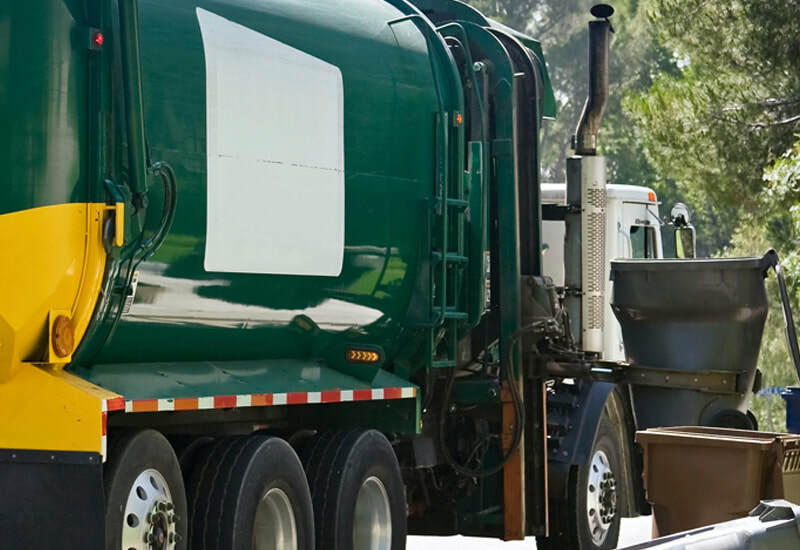 What Do Other City Councils Do? 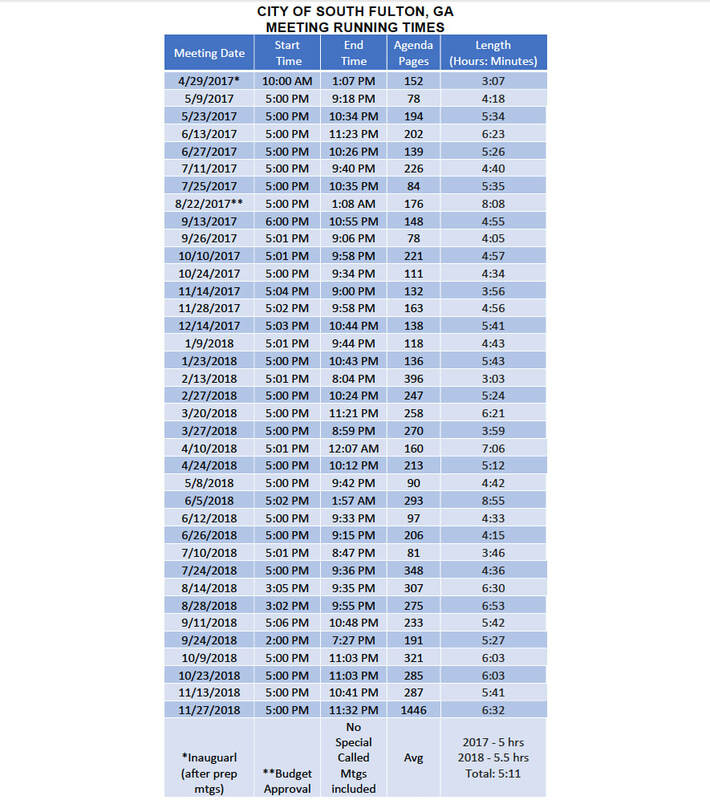 In an effort to ensure constituents & city staff get home to their families earlier in the evening, Councilman khalid is proposing moving the start time City Council's 2nd & 4th Tuesday meetings to earlier in the afternoon. Work Sessions, where complex issues are discussed in depth, would begin at 1 or 2pm. The Regular Meeting would begin at 5pm, with Public Comment occuring around 5.30pm. All meetings would end at 8.30pm. With 100,000 people spread over 100 square miles with a $100 million budget, South Fulton is one of the largest cities in Georgia. Our meetings will naturally run longer than smaller neighbors like Fairburn, Hapeville or Chattahoochee Hills. Comparative reasearch of Georgia's 10 largest cities (by population or square miles) reveals many of their City Councils, like ours, meet 10-12 hours per month. 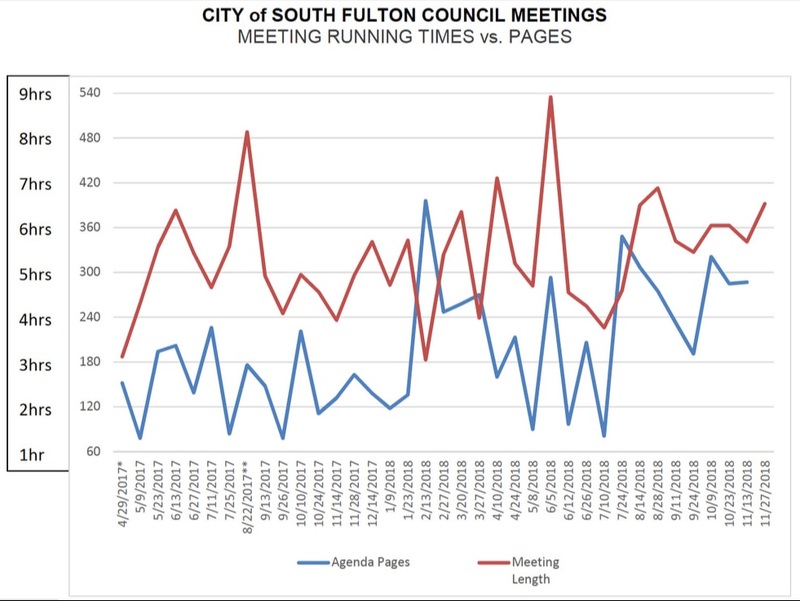 However, other large cities break up those hours by meeting more oftern, or meeting with departments in smaller Committees ahead of the Regular/Voting meeting. 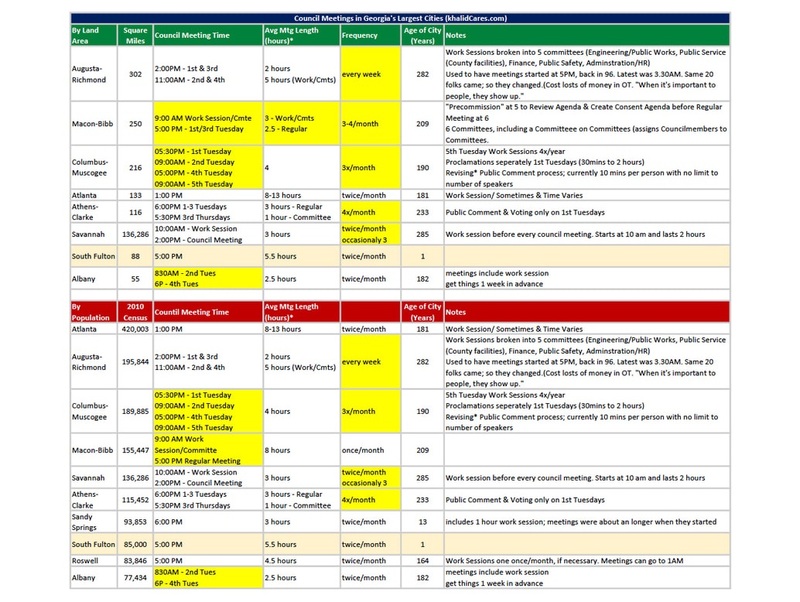 Some alternate between AM & PM Council Meetings to reach the maximum amount of interested residents (see gold highlighted examples in the the third chart, below). 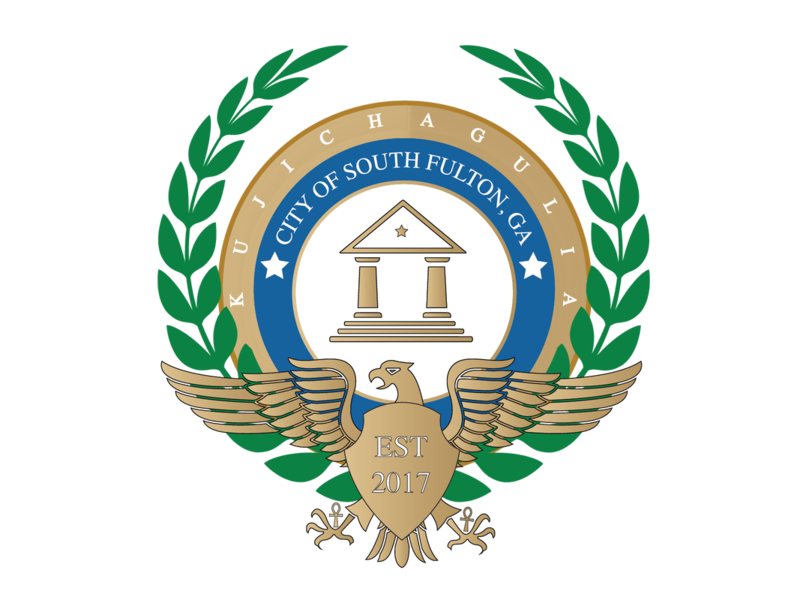 Though the City of South Fulton is 90 percent African American, 0 percent of current City Seal contains any reference to African or African American culture. Councilman khalid & Mayor Pro tem Mark Baker have proposed a revised City Seal with minor revisions. The bird & Acropolis – which take up the majority of space on both seal – are a reference the Greek roots of western democracy. However, historical research reveals that Greece's first philosophers studied at universities in Alexandria, Egypt. In the New Seal, Ankhs have been added to represent western democracy's true, African origins. The City of South Fulton currently has no city motto. Dissatisfied with the way our community was being managed by County Commissioners who lived on the "other side of town," South Fulton's founders fought for cityhood to gain local control of our tax dollars & economic development — so we could determine our own destiny. In recognition of this founding principle of "self-determination," and South Fulton's 90 percent African American population, khalid & Baker chose the Swahili word Kujichagulia - which literally means "self-determination." The Resolution calls for a gradual phasing out of the current City Seal to eliminate any financial impact to the City to replace the Seal. As we consider re-branding South Fulton, conversations have begun to rename streets like Old National & Stonewall Tell — names which celebrate the Confederacy, in which a majority of South Fulton's current citizens would have been slaves. One popular suggestion is renaming Old National in honor of America's first Black President in an effort to attract minority-owned business to the area. 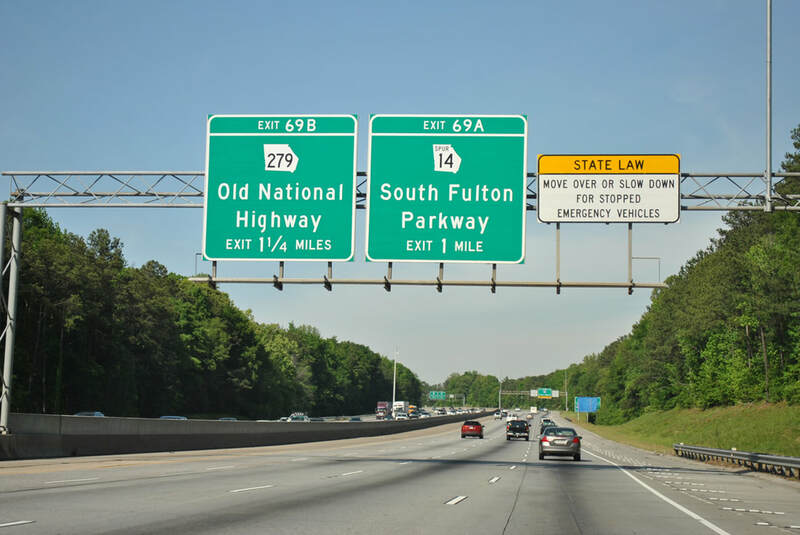 Barack Obama Parkway Obama National Parkway (O Nat) Barack Obama Boulevard Obama National Boulevard (O Nat) Barack Obama Avenue Obama National Avenue (O Nat) Marcus Garvey Parkway Marcus Garvey Avenue Other Keep the Name "Old National"
Reality Show for City of South Fulton Government? The City of South Fulton's female-led Court System was featured on HBO's Vice series. After garnering national attention for its female-led justice system, including a HBO Vice special, Hollywood has come calling to South Fulton. Chief Judge Tiffany Carter Sellers, Solicitor Ladawn Blackett Jones and Public Defender Viveca Powell have signed an exclusive deal with Good Caper Content, the crime reporting division of ITV America, for an unscripted docuseries about South Fulton's Municipal Court. The series is currently in development, and producers are shopping for a television network to air the reality TV show. Sounds like a Great Idea! Seems like a Bad Idea. Unsure. I'll have to see the show.